WASHINGTON—The Senate’s top Democrat is introducing legislation to “hold China accountable” and sanction laboratories and other traffickers who export fentanyl to the United States. The bill, which will be introduced by Sen. Charles Schumer, of New York later this week, is likely to add to growing tension between the United States and China, days before Treasury Secretary Steven Mnuchin and U.S. Trade Representative Robert Lighthizer will lead high-level trade talks in China. In December, Beijing agreed to label fentanyl, the deadly synthetic opioid responsible for tens of thousands of American drug deaths annually, as a controlled substance. Schumer’s legislation—known as the Fentanyl Sanctions Act—would direct U.S. officials to publicly identify foreign opioid traffickers, would deny the traffickers visas in the United States and would prohibit them from doing business using American banks. The bill aims to “hold accountable” fentanyl manufacturers in China and other countries that illegally drugs to the United States, Schumer said. It could also be used to target transnational gangs and cartels involved in fentanyl trafficking, as well as banks that help those organizations, he said. 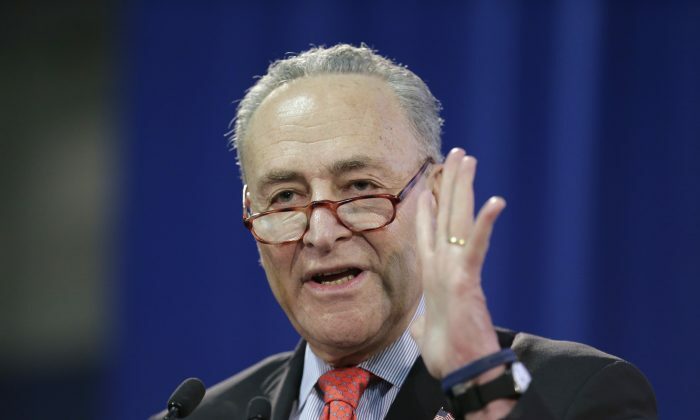 “For years, Chinese laboratories have been cooking-up formulas of death and freely exporting lethal fentanyl across New York, and to many other places across America, where it is killing tens-of-thousands of people and it has to stop,” Schumer said in a statement to The Associated Press. The legislation would also require the United States to create a commission to oversee synthetic opioid trafficking, which would monitor efforts to combat fentanyl trafficking from China and Mexico and issue reports on its findings. It also provides additional funding for law enforcement agencies that are trying to combat synthetic opioid trafficking. Schumer said the bill is necessary because Congress hasn’t been provided with a “signed and enforceable agreement, a solid plan or genuine commitment” since China has agreed to label fentanyl a controlled substance after a meeting between Trump and Chinese leader Xi Jinping during the G-20 summit in December. U.S. officials have been pressing the Chinese regime for years to take a tougher stance against fentanyl, which is 50 times more powerful than heroin. Most U.S. supply of the drug is manufactured in China.